Welcome to the latest edition of the Marketing Leverage Times. Our goal is to provide you with provocative information and thought-provoking commentary on marketing and business issues to help you better leverage your investment in marketing programs, processes and people. We hope you will enjoy this regular collection of tips, tidbits and tools and we welcome your input and feedback. Tell us what you like and don’t like and what you’d like to see in future editions. This issue is a bit different than our normal newsletter. As many of our readers know, I recently lost my father, Marty Popky, following a long, extended illness. As we’ve had the opportunity to connect with friends, family, and acquaintances over the last several weeks, we’ve been reminded not only of his many accomplishments but also the way he lived his life. My dad was a businessman and an entrepreneur. Not only did he start and run several businesses, but he also founded and supported a variety of nonprofit organizations, and he dedicated countless hours on an ongoing basis to helping others less fortunate. I’ve collected a few of the lessons learned that are relevant to many of us in the business world today. How can a five-cent credit card charge cost Citibank hundreds or even thousands of dollars? Read our recent post to find out. The Marketing Leverage Hall of Shame/Fame is dedicated to those companies who go out of their way to differentiate their customers’ experiences, for better or for worse. Have a Hall of Shame/Fame tip? Send us your stories and anecdotes. Each issue we’ll publish one of the best. If we choose yours, you’ll receive a special Leverage2Market memento (and the fame of being highlighted here) as our gift. Email linda@leverage2market.com with your suggestion. Need to beat the summer doldrums? 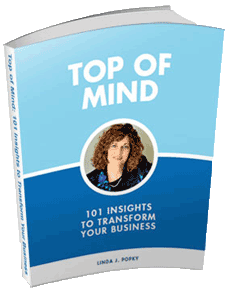 Why not learn about how to better position and package yourself for success. For the month of July only, Woodside Business Press is offering members of the Leverage2Market community special pricing on our handbook. The handbook is also available from Amazon.com. Our Invincibelle blog comment on Business Week’s article “The Slump: It’s a Guy Thing” was picked up and highlighted in the Feedback section of the June 2nd issue of Business Week. Linda’s article, The Worst of Times, The Best of Times was featured in the Women in Consulting Corner of Consultants Crossing in February 2008. 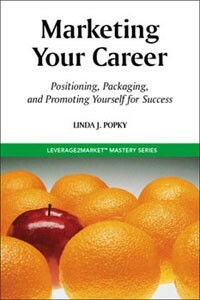 Women in Consulting’s July 8th seminar will feature Linda on the topic of Marketing Product You: Positioning, Packaging, and Promoting Yourself for Success. For more information or to register, contact WIC. Linda will again be teaching Branding Strategies this summer and fall as part of the Integrated Marketing Program at San Francisco State University’s College of Extended Learning. For more information, please contact SF State at www.cel.sfsu.edu or 415-405-7700. We are in the process of booking our Fall ’08 speaking schedule. Download our updated Speaker Sheet. Remember: Our workshops and seminars are available to individuals and corporate groups. Contact us at info@leverage2market.com for more information. 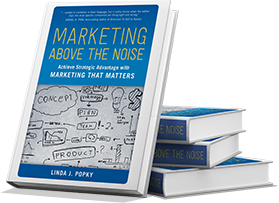 You are receiving this newsletter because you have been identified as someone who may be interested in receiving communications related to marketing strategy from Linda Popky and/or Leverage2Market Associates. We do not ever sell, rent, lease or otherwise distribute our mailing list. If you would like to be removed from this list, please unsubscribe here. Please feel free to forward this newsletter to others you think may enjoy it. To be added to our subscription list, please subscribe here. For more information on how to better leverage your investment in marketing programs, processes, and people, contact us.